In the Fan’s Choice for Kpreps Game of the Week, 6A No. 3 Blue Valley used a big first half to knock out 5A No. 3 Blue Valley West, 30-13. Blue Valley quarterback Colton McCumber produced nearly 250 yards of total offense as the Tigers built a 27-6 halftime lead. McCumber completed 9 of 11 pass attempts for 132 yards and a touchdown, and rushed for 115 yards and another score. A.J. Totta added 82 yards and a touchdown on the ground for Blue Valley. The Tigers took advantage of four Blue Valley West turnovers in the game, and held the Jaguars to just 93 rushing yards on 42 carries. In a battle of ranked teams from the Sunflower League, No. 2 Olathe North rallied to top No. 5 Lawrence Free State 14-7. Venus Triplett scored on a three-yard touchdown run midway through the fourth quarter to provide the winning points for the Eagles. Olathe South routed bitter rival Olathe East 46-17 on Friday night. The Falcons defense picked up an Olathe East fumble on the first play of the game and raced into the end zone to grab the early lead. South extended that lead as much as 40-3 early in the second half on a Jake Seurer touchdown. The game was overshadowed by a serious injury to Olathe East’s James McGinnis in the second half. McGinnis collapsed after getting up from a tackle and was taken to a local hospital by ambulance. On Thursday night, Blue Valley Northwest raced out to a 27-7 first-half lead before holding off Mill Valley 34-26. Miles Alexander rushed 30 times for 216 yards and four touchdowns for the Huskies. Mill Valley quarterback Logan Koch carried 28 times for 238 yards and three scores, but also tossed three interceptions –including a 50-yard pick-six by Northwest’s Jake Loftness. Hays turned the Cox Channel Kansas Friday Night Live showcase into a rout as the Indians rolled past WAC rival Great Bend, 49-6. Hays quarterback Alex Delton helped his team produce nearly 350 yards of total offense on the night and overcome four turnovers. Delton broke the game open with an 82-yard sprint for a touchdown in the third quarter to make the score 28-0. Holton rebounded nicely from their season-opening loss to Silver Lake by blasting Maize South, 40-21. The game wasn’t as close as the final score indicates as Holton grabbed a 20-0 lead and led by as much as 40-7 in the third quarter. Justin Rieschick rushed for three first-half touchdowns in the win. 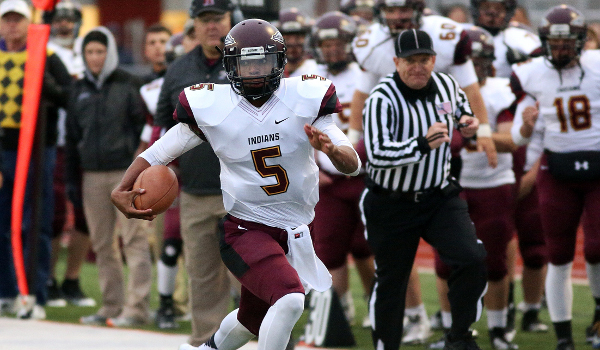 Kansas Gameday presented by Kpreps featured Chapman at Southeast of Saline. Cody Schlesner rushed for a touchd own and passed for another score as the Trojans beat Chapman 21-12. The Trojans led 21-0 at halftime after Kayden Besher scored on a 45-yard touchdown run. The Irish added two touchdown in the final quarter to narrow the gap. Eion Jackson scored for Chapman as part of his 90-yard rushing night. At one point on Friday night, the top three teams in the Class 2-1A rankings were in danger of losing. Of those three, only top-ranked La Crosse would rally to stay unbeaten. The Leopards trailed 7-0 at halftime and 7-6 late in the game, but tacked on a touchdown with less than a minute to go to escape Larned with a 14-7 win. Things didn’t turn out so well for No. 2 Phillipsburg and No. 3 Oakley. Phillipsburg trailed only 6-0 to Norton at halftime, but the Bluejays scored 28 points in the second half in routing the Panthers 34-7. Oakley ran at will against Smith Center, but lost seven turnovers and fell 35-8. The Plainsmen rushed for more than 330 yards on the night, but could not hold on to the ball. Congratulations to the Republic County Buffaloes for snapping a 33-game losing streak with a 34-21 win over Russell. The win was Republic County’s first since September 24, 2010 when the Buffs knocked off Sacred Heart, 22-7. That win back in 2010 stopped a 29-game streak for Republic County. The Buffaloes’ program has struggled in having posted a 6-84 record over the past ten season entering 2014. For the second consecutive week the Osborne Bulldogs played the top-ranked team in 8M-II, and for the second consecutive week the Bulldogs came away with a victory. Osborne built a 26-14 halftime lead and held on to beat Beloit St. John’s-Tipton 42-22. St. John’s-Tipton rallied after halftime as Trey Dubbert hit Parker Gates on a touchdown pass to pull the Blujays within 26-22. Osborne would answer as Jake Tiernan tossed a 30-yard touchdown pass to Brandt Wolters late in the third quarter to extend the lead to 34-22. Tiernan passed for 196 yards and two touchdowns in the game., while Wolters hauled in nearly 115 receiving yards on eight catches. Tiernan also rushed for 71 yards and a pair of scores. Osborne defeated Thunder Ridge 52-28 in week one. Uniontown built a 16-0 lead before 8M-I No. 5 Madison woke up and scored 40 consecutive points to close out the first half. The Bulldogs held a 24-16 lead late in the second quarter when a blocked Uniontown punt led to a short Madison touchdown drive. The Bulldogs led 40-16 at the break, and 40-22 as the fourth quarter got underway.